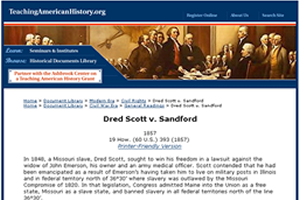 This site was created especially for teachers and has a very clear, but yet brief, overview of the Dred Scott case. In addition, both Taney’s majority decision and the two dissenting opinions are provided so that students can read the debate from both sides. This site is brief enough to keep students’ attentions and integrates primary source documents into its material without becoming cumbersome.